Savory (1999). Medium [20" tall x 24" wide]. Lavender flowers early season. Hosta 'Ivory Coast' is a smaller sport of the beloved 'Sagae'. 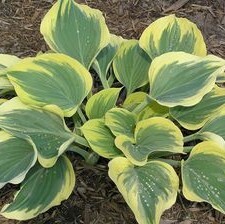 The broad, nearly round leaves feature rippled, wide, jetting yellow margins that lighten to white by summer. The center of the thick pointy leaves are blue-green to grey-green. If you do not have room for the giant 'Sagae', this may be just your size. Even those with 'Sagae' in their gardens would appreciate the attractive features this plant gives us. PLANT SIZE: This plant is shipped well rooted and growing in a deep 1 quart pot (36.2 fl oz). Plants have over-wintered at least 3 years and often have multiple eyes. SHIPPING SEASON: Late March through October.